If the “infamous” “New York Herald” issue of April 15, 1865 is the most common reprint edition about which we receive phone calls and messages, then the “Ulster County Gazette” of January 4, 1800 has to be next in line. However, I disagree that it is worthless. It is a good paper to take to grade schools and talk about “source” material without worrying about it. Think of the number of issues printed and sold. Was it really to teach how to set up type? Why not. Also,it was issued for special Washington events. 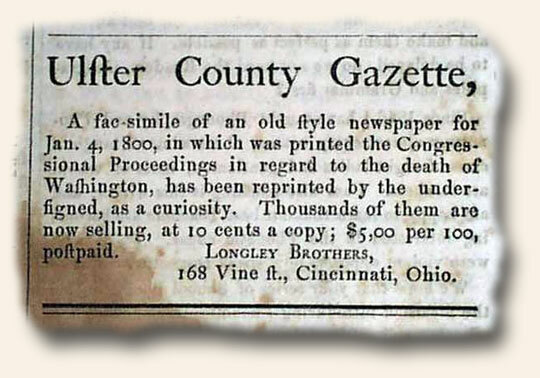 You don’t mind framing your copy and there are interesting articles besides Washington’s death. If you are going to collect the paper, make sure you have a copy or access to “The Ulster County Gazette and its Illegitimate Offspring” by R. W. C. Vail, New York Public Library, 1951 or Library of Congress Information Circular 1 (revised 1950) at (http://www.loc.gov/rr/news/circulars/ulster.txt And the most fun was when the Smithsonian had a picture of the Gazette at the top of their webpage and I pointed out to them that it was a picture of the copy. They acknowledged and corrected it. I do have a nice collection of the Gazette and enjoy them. The legit newspaper community doesn’t recognize the paper as a collectable but it is and might be for a number of folks – like me.